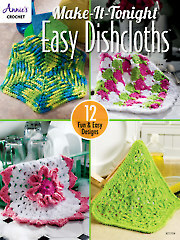 The treble crochet is a tall stitch that works up quickly and a little taller than the double crochet. 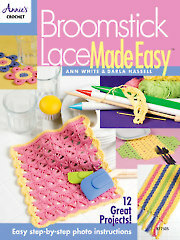 We will now begin working Row 1 of treble crochet. 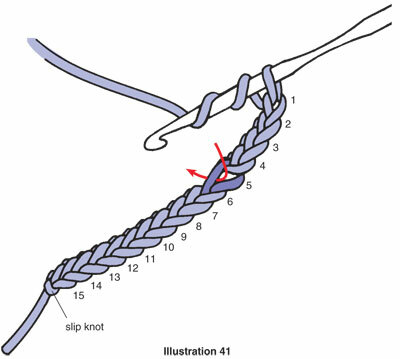 Step 1: First make a slip knot and chain 15 stitches loosely. 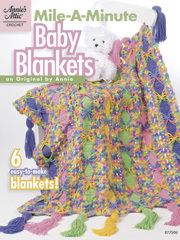 Wrap the yarn around the crochet hook from back to front twice, skip the first four chains and then insert the hook into the fifth chain from the hook (see illustration 41). 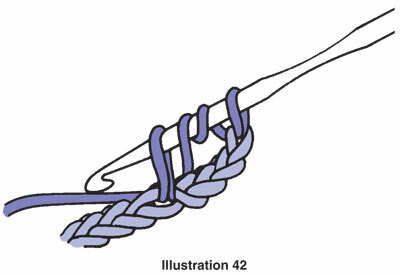 Step 2: Bring the yarn over the crochet hook (from back to front) and draw it through the chain stitch and up onto the working area of the hook; you now have four loops on the hook (see illustration 42). 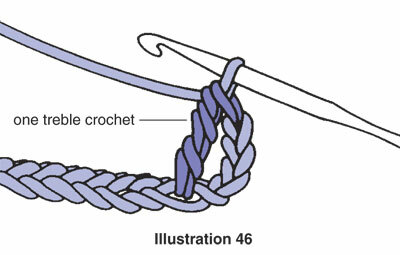 Step 3: Bring the yarn over the crochet hook and draw it through the first two loops on the hook (see illustration 43a).You now have three loops on the hook (see illustration 43b). 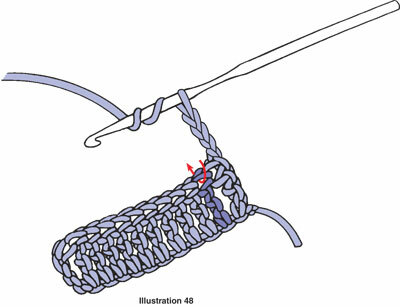 Step 4: Bring the yarn over the crochet hook again and draw it through the next two loops on the hook (see illustration 44a). 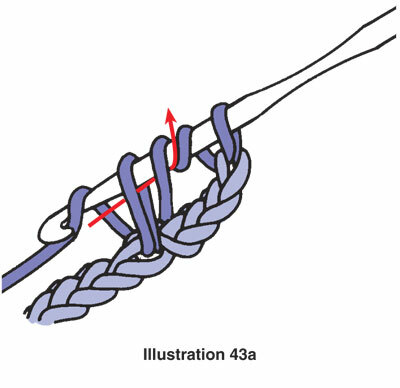 Two loops remain on the hook (see illustration 44b). 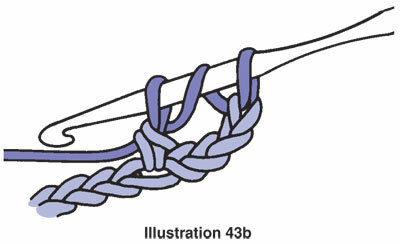 Step 5: Bring the yarn over the crochet hook and draw it through both remaining loops on the hook (see illustration 45). 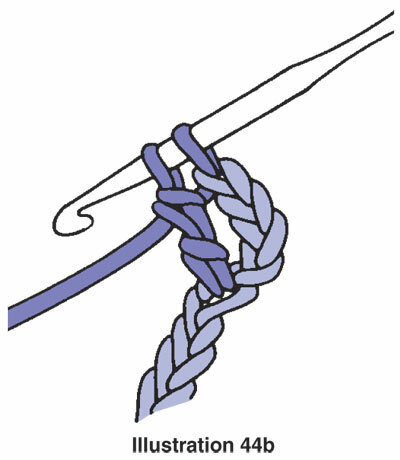 You now have completed one treble crochet; one loop remains on the hook (see illustration 46). Turn your work counterclockwise and we will begin working row 2. To work row 2, you need to bring the yarn or thread up to the correct height for the next row. 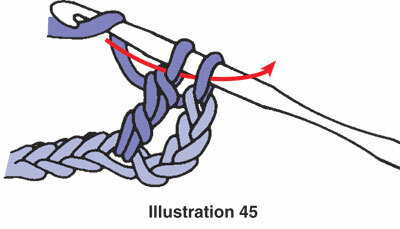 To raise the yarn, chain four (this is called the turning chain). The four chains in the turning chain just made count as the first treble crochet on the new row. 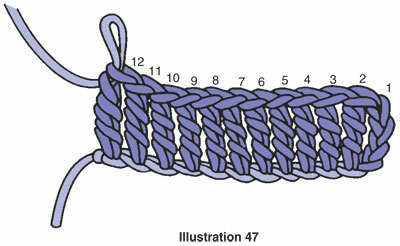 Skip the first stitch and work a treble crochet in the second stitch (see illustration 48). 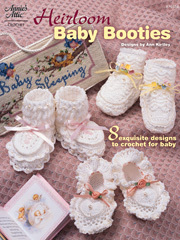 Be sure to insert the crochet hook under top two loops of each stitch. 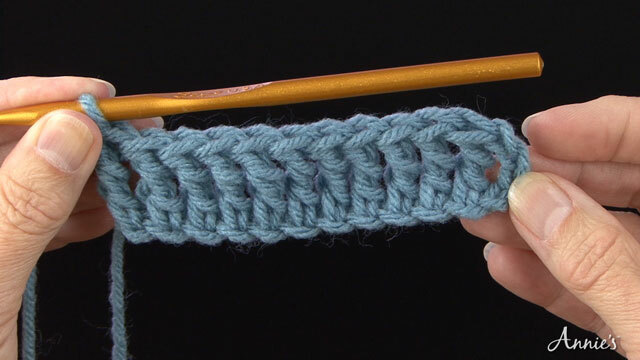 We will continue to work a treble crochet in each remaining stitch across the previous row; be sure to work the last treble crochet in the top of the beginning chain from the previous row. 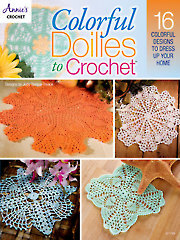 Stop and count your treble crochets; there should be 12 stitches.